We’re excited to be getting into the Christmas spirit here. 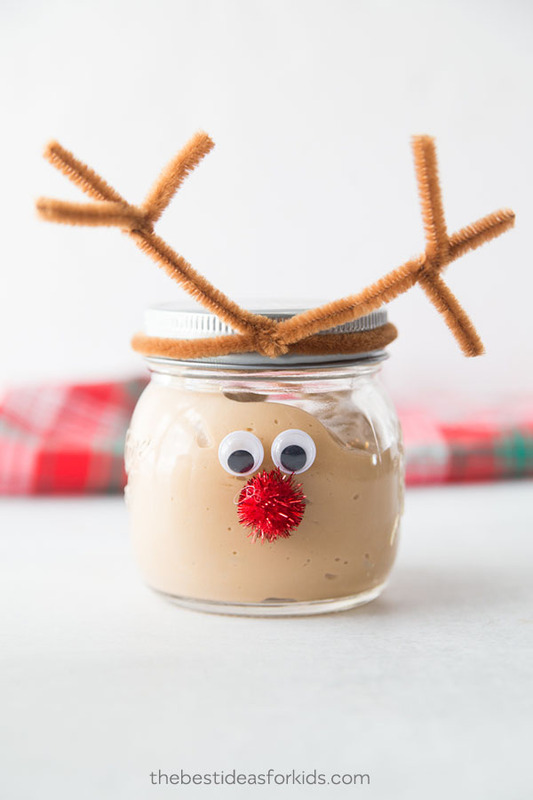 And we couldn’t wait to share these adorable Christmas Slime jars with you! These would make fun Christmas gifts or would even just be a fun Christmas activity for kids to do. You can make all 3 or make just one of them! 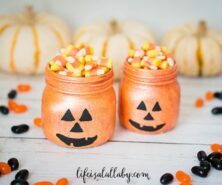 And if you haven’t seen our Halloween Slime Jars, head over to see how you can make similar jars for Halloween! 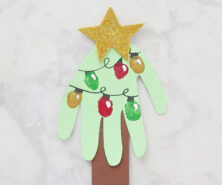 We have done a few snowman and Rudolph crafts for Christmas before, but this is our first Grinch craft. We can’t help but smile at that Grinch face. 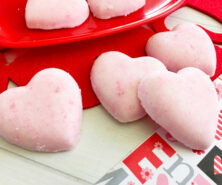 You’ll definitely warm someone’s heart with these! We made Halloween Slime Jars and they have been such a popular craft we had to make some for Christmas too! And the best part about this activity is it’s easy! It uses our 3 ingredient slime recipe. No more slime fails with this one! 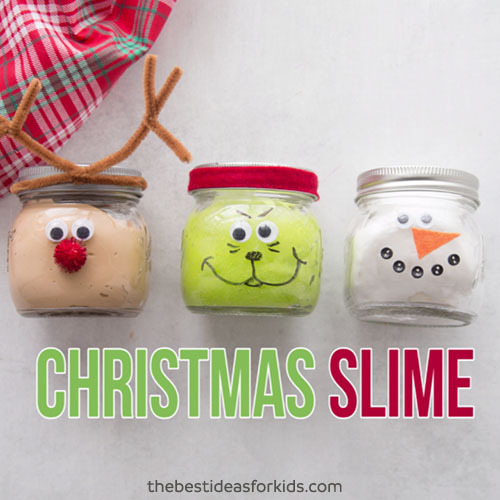 Christmas Slime – an Easy Slime Activity! 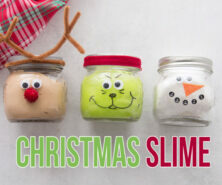 Now meet our 3 Christmas Slime Jars that we’ll walk you through how to make. First is our Rudolph slime jar – that bright red nose will surely brighten someone’s day! And brown slime? Doesn’t sound appealing but kids will love playing with it! 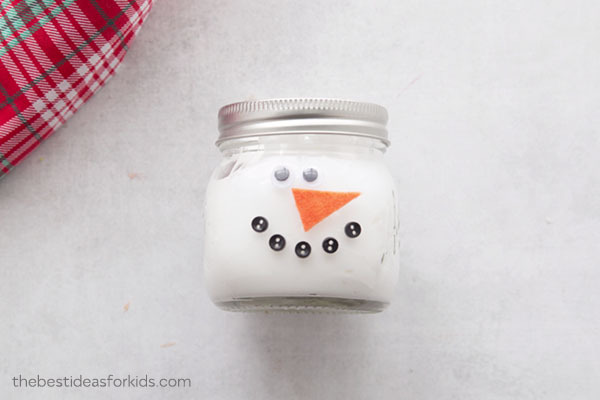 Next is our snowman slime jar – this one is our favorite (or maybe tied with Rudolph we can’t decide!). 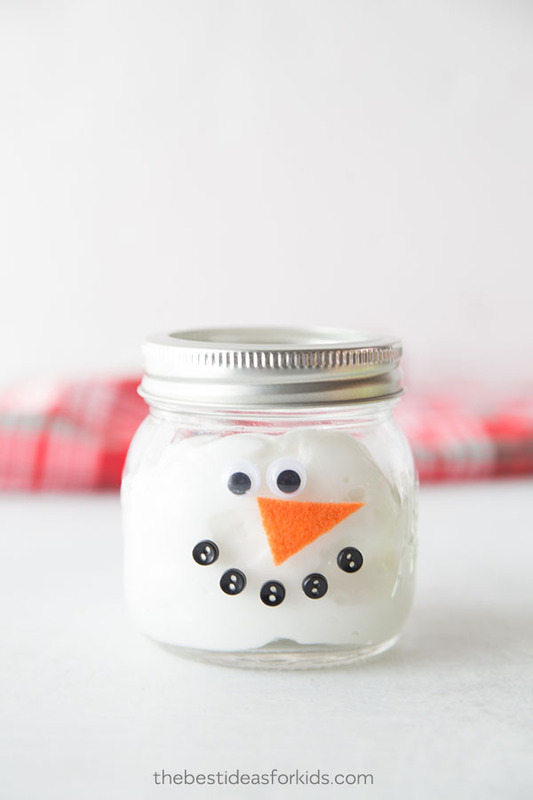 The face reminds us of this adorable marshmallow snowman ornament. What a cute snowman! And the best part about this slime is it’s white – no dying or special colored glue required to make this one! 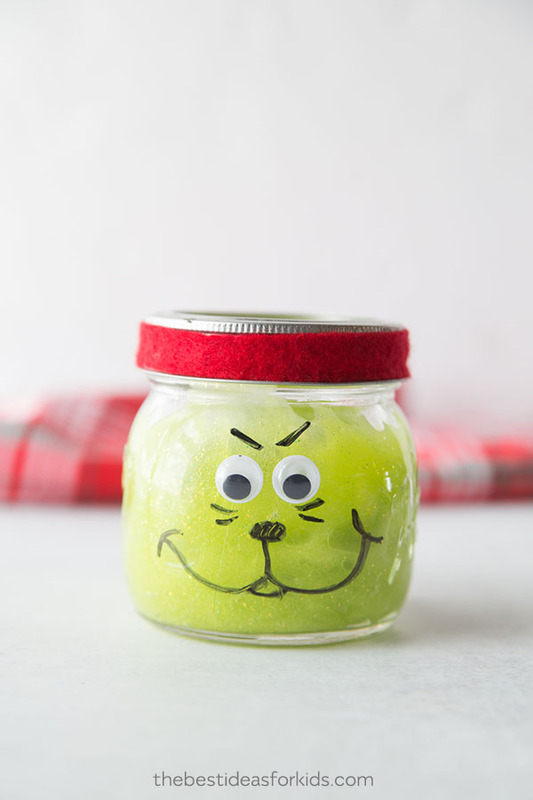 And finally, our last jar is the Grinch slime jar. He may look unhappy but we’re positive you’ll be happy making him! 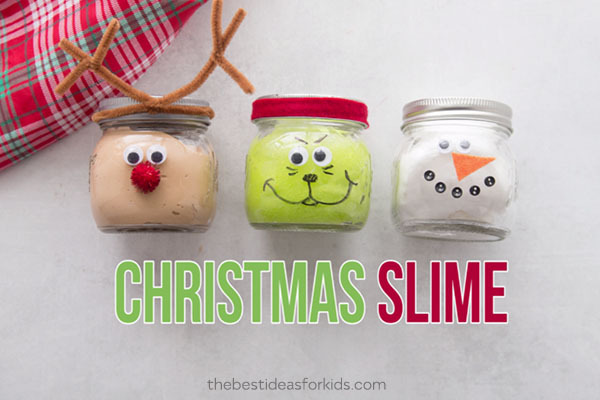 Now let’s get into the details on how to make this Christmas slime! 1 bottle of Elmer’s glue (6 oz) – we used white (2 bottles) and glitter green and repeated the recipe 3 times. Note: we made this with Elmer’s glue. It is recommended you do not substitute with other glue as the make-up may not be the same and the recipe may not work (especially Dollar store glue many people report having problems using this). Brown food coloring for the Rudolph slime jar. At this to your glue before following our slime recipe steps. *Note: the food coloring may stain, use wax paper to cover your table when playing with it and avoid contact with anything you do not want stained. 1½ TBSP of Contact lens solution. **Important: your brand of contact lens solution must have boric acid in the ingredient list. This is what interacts with the glue to form the slime. Now for step-by-step directions on how to make the slime, visit our Slime Tutorial Page. For the Rudolph Jar: Glue on your googly eyes and red pom pom. 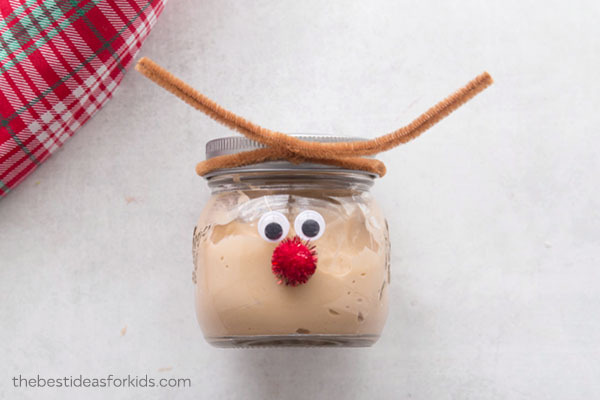 To make the antlers, tie one pipe cleaner around the jar lip. Cut two smaller pieces of pipe cleaner and then tie these around your two ends. For this slime, you’ll need to use brown food coloring to dye your glue brown. For the Snowman Jar: glue on your googly eyes, orange felt for the nose and small black buttons for the mouth! 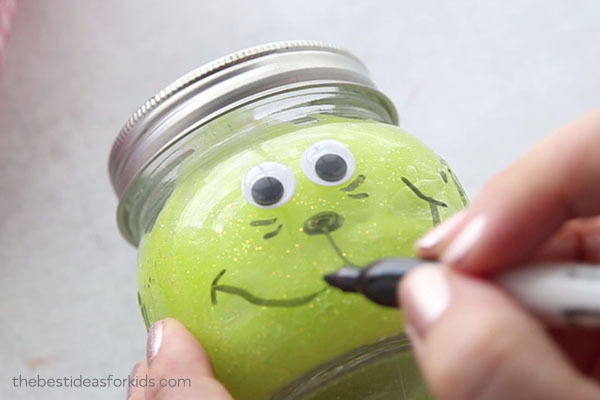 For the Grinch Jar: Glue on your googly eyes and then make the face using a black sharpie. Cut a strip of red felt to fit the size of the jar lid and hot glue this to your lid (adults only). Now that your jars are made don’t forget to grab the recipe for how to make your slime. Full recipe and step-by-step instructions HERE. Now you can play! 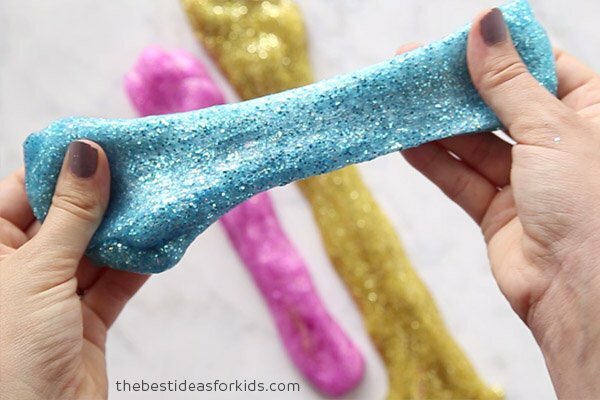 Give these as gifts or simply have the kids play with their Christmas slime! These would also be perfect for a Christmas party. Then seal up the jars when you’re done for safe keeping and storage. 1½ TBSP of Contact lens solution. *Important: your brand of Contact Lens Solution must contain boric acid and sodium borate. 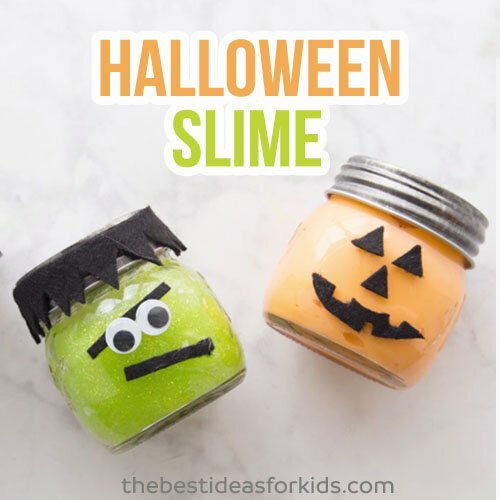 And if you love these slime jars – be sure to see our Halloween Slime Jars! And check out our most popular slime – this Unicorn Slime Recipe is a favorite! As long as it’s air tight it should last at least a few weeks. We did black paint or ink fingerprints for the snowman mouth instead of buttons. Cheaper and more personalized for children to do so thought I’d share! What do you do if you have 22 kids that are making them how baches would you make if you had small jars? Small jars you could probably split 1 batch between 2 jars, or if using baby food jars you could probably get 3 out of them. Have fun! Would baby food jars work? Where do you purchase the clear jars from? I love this idea! What size jar did you use?